Pair of Adjustable Front Lower Camber / Caster Alignment Ball Joints for Down-sized Jeep Cherokees, Wranglers, Comanches and Grand Cherokees. 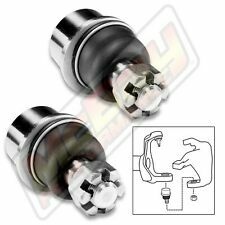 (see below for exact applications) These lower ball joints are designed to give you extra camber adjustment that you can't get with factory adjustments. Designed to meet or exceed factory specs and durability. Fully adjustable (unlike the competition) from 0° to 1.75°. Just set the ball joint and go. Also allows for future adjustment if your alignment changes. A PERFECT Kit for Lifted Vehicles! ---OEM Style Design Does NOT Affect Ride or Handling ---Kit Includes: 2 Lower Adjustable Ball Joints (adjusts both sides of the vehicle) Part #: 44-2490(2) Adjustment Range: Caster/Camber 0° to /- 1. "Crown Pinion Shim Set -- CROWN PINION BEARING SHIM KIT -- For Model 44/226 mm axles; 0.04 in. Notes : Pinion Shim Set (.040 in. to. 044 in.). Quantity sold : Kit. Condition : New. Therefore all implied warranties that may apply to your part are limited to the duration of this written warranty. Quantity sold : Kit. Notes : with Model 30 Front Axle. Condition : New. Therefore all implied warranties that may apply to your part are limited to the duration of this written warranty. Each warranty gives you specific rights, and you may have other rights which vary from state to state. Replaces oe number : 5083673, 708192. Notes : w/ Dana 44 Rear Axle; Includes Pinion Shims, Pinion Nut, Differential Cover Gasket, and Sealant. Quantity sold : Kit. Condition : New. Therefore all implied warranties that may apply to your part are limited to the duration of this written warranty. Quantity sold : Kit. Notes : with Model 44 Rear Axle; Includes sealant. Condition : New. Therefore all implied warranties that may apply to your part are limited to the duration of this written warranty. Frequent automotive care is important for safer or comfy ride. Quantity sold : Kit. Condition : New. Therefore all implied warranties that may apply to your part are limited to the duration of this written warranty. Frequent automotive care is important for safer or comfy ride. Quantity sold : Set of 5. Therefore all implied warranties that may apply to your part are limited to the duration of this written warranty. Quantity sold : Kit. Notes : with Model 35 Rear Axle. Condition : New. Therefore all implied warranties that may apply to your part are limited to the duration of this written warranty. Each warranty gives you specific rights, and you may have other rights which vary from state to state. Authorized Fabtech Dealer. Fast & Free Shipping! presents SPC REAR ADJUSTABLE UPPER CONTROL ARM KIT W/ xAxis This auction is for a SPC rear adjustable upper control arm kit '1 Side' Part# 13420 Front Adjustment range: Pinon 3.0° This direct-fit rear upper control arm adds strength, on-car adjustability and articulation flexibility to your stock-height or 'lifted' Wrangler. It features SPC's xAxis sealed flex joint receiver at the frame end to provide bind-free 'twist' during off-road articulation and an OE rubber bushing on the axle end to reduce NVH (Noise Vibration Harshness). D.O.M. steel contruction and forged link provide the strength required for large tires and agrresive gearing. The dual-threaded adjuster and jam nuts make rear pinion angle adjustments quick and easy without the need to disconnect the arm. 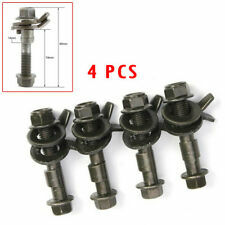 "Moog Cam Bolt Kit --. Quantity sold : Kit. Therefore all implied warranties that may apply to your part are limited to the duration of this written warranty. Each warranty gives you specific rights, and you may have other rights which vary from state to state. Part Number For use with: 2.0"-4.5" Lifted Vehicles. Designed for perfect fit and function. Rough Country 1081 - Front Lower Control Arm Cam Bolts 2007-2018 Jeep Wrangler JK 4, For use with the front lower control arms ONLY, Fits: 2007-2018 4WD Jeep JK Wrangler 2007-2018 4WD Jeep JK Wrangler Unlimited 2007-2018 2WD Jeep JK Wrangler Unlimited, Includes - (2) Cam bolts. FRONT 1.0° CAMBER SHIM. Make camber changes in .5° or 1.0° on many popular models by installing this shim between the hub and steering knuckle. A caliper shim is also included. These durable high-strength nylon shims provide a faster option for correcting negative camber issues. 84-01 Cherokee. 97-06 Wrangler. 94-98 Grand Cherokee. 93 Grand Cherokee V8 5.2L. Warranty Claims. 84-90 Wagoneer. 93 Grand Wagoneer. The engine types may include 2.4L 148Cu. l4 GAS DOHC Naturally Aspirated, 2.4L 2429CC 148Cu. l4 GAS OHV Naturally Aspirated, 2.5L 150Cu. l4 GAS OHV Naturally Aspirated, 2.5L 2466CC 150Cu. l4 GAS OHV Naturally Aspirated, 3.6L 3604CC 220Cu. Grand Tex Part Number: 23023. About the Manufacturer. Aout the manufactur. Notes 1: Features SPC xAxis technology. Model: JK Wrangler. Make: Jeep. Type: Lower Contol Arm. The item page will indicate which service is used for that specific item. Need More Jeep Parts ?. Notes 1: Features SPC xAxis technology. D.O.M steel construction provides the strength required for large tires and aggressive gearing. Model: JK Wrangler. Make: Jeep. The item page will indicate which service is used for that specific item.